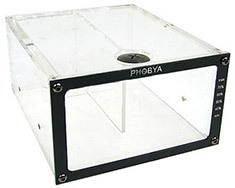 The Phobya Dual Bay Reservoir fits in a two 5.25in bays and offers an expansion for coolant. Covered by a black faceplate which shows the fill level, the Phobya Dual Bay Reservoir allows you to use coloured coolant to enhance the look of your case. It features four 5mm LED holes at the rear for additional lighting effects.